Usually I prepare 3 to 4 variations in Tomato rice, this is one of them. This variation is like; we prepare tomato gojju (sauce like) ahead and mix it with cooked rice when needed. You can also keep the gojju in the fridge and use it whenever you need it. The Tomato gojju stays good in fridge for 10 days also. This rice will have nice and tangy tomato flavor with some pods of garlic and onion. This is absolutely wonderful rice that can be made for big parties, potlucks, picnics as well as lunch box. The measurement I am posting today will have extra gojju; you can store them in refrigerator for later use. Even u can use this gojju as a side dish for idly or dosa. 1. Heat oil in the pan and add the seasoning ingredients one by one. 2. Add the saunf powder and curry leaves. 3. Then add the garlic after it is slightly brown add the slice onion too. 4. Saute till light brown then add tomato chopped. 5. To this add salt, turmeric, chilli powder. saute until everything is well mashed and oil separates. 6. switch it off and once cooled store in air tight container. Mix the gojju with rice , adjust salt and oil as needed and garnish with coriander rice. Serve with chips, vadagams, raita or Boiled egg too. For variation you can add cooked peas to rice. what is that surrounding the rice? If you try frying the cooked rice in ghee,and repeating the remaining steps it will taste crisp and smell great..
Yummy Tomato Rice..and beautiful presentation as ever..keep up lady. Delicious rice and lovely presentation Pavi! Wow..what a presentation dear. Luved the rice. My fav rice.. so simple yet so flavourful. Looks perfect, and yes, I must add-as usual! I just loved your tomato rice recipe!! will make it today may be!! That dish looks so beautiful. Great recipe. Lovely picture of tomato rice.It looks yummy and feel like having it now.I will definitely prepare this tomato rice.Thanks for your nice recipe. This tomato rice look gorgeous! This looks so delicious! And I have all kinds of tomatoes in my garden - perfect for this! Wow!yummy rice &ammmmzing presentation dear! Beautiful presentation pavithra. love the recipe but I also agree with what abhilash pillai has commented and that can also be another version.Looking forward to your more versions. hats off to ur creativity!!! Saunf and garlic gives a great flavor! Love it!! Whoa! lovely colour.Your presentation.... Jabardhast!!! 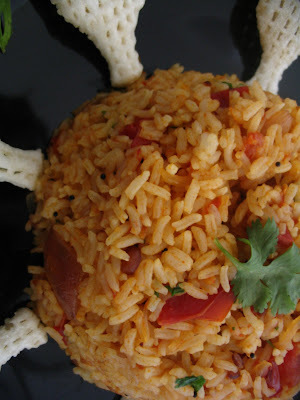 tomato rice looks so tempting nice pic. 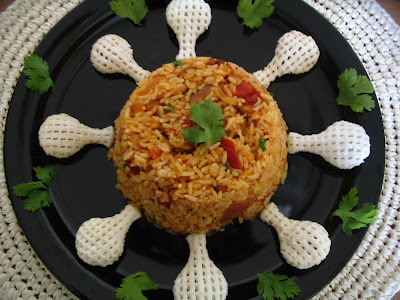 A great tomato rice dish..the decoration is fascinating. hi pavithra, nice presentation...its really gud. i love your presentation! Very diff way of making tomato rice, sounds so nice!! Wowow this rice looks delicious! This looks very good. All the right flavours and colours to make such an attractive dish! Lovely presentation. Seasoning with sesame oil would have given a very good taste. Looks yummy. Tomato rice looks so colourful and yummy. I loved the presentation. Mmmm sounds good and the presentation is beautiful as usual. Pavithra, I love the cute presentation. 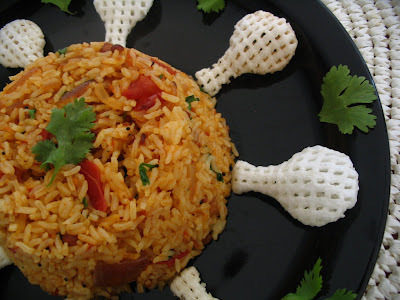 Tomato rice is a huge favorite in our home too. Very yummy rice. The pic looks so nice. I will definately try ur recipe for tomato rice. Presentation as usal too good. I love the presentation and we all love Tomato rice in my family.It is dlish! Lovely Pavithra, awesome presentation! whats those cream ones at the sides? உங்களின் ப்ளாக் நன்றாக இருக்கிறது.டோமடோ ரைஸ் சுத்தி அலங்கரித்திருப்பது என்னது?பன்னீரா?அழகாக உள்ளது உங்களின் பிரசண்டஷன்.என் ப்ளாக்கில் தங்களின் வருகைக்கும் கருத்திற்கும் நன்றி.தொடர்ந்து வாருங்கள். என்னுடய ப்ளாக பக்கம் வருகை தந்தமைக்கு நன்றி. Dear, i have award and tag in my blog for u..pls accept it. hey i love tomato briyani ! hmmm looks very yumm ! what is the decoration on the side? I tried this and it came out awesome! The pictures in the steps really helps. Love it.